You may perceive the typical low-carb dieter as one who dines on bacon, beef and chicken with gusto, shunning starches and grains, such as bread or pasta. But, low-carb isn't restricted to meat-eaters only. You can be a vegetarian and still follow a low-carb lifestyle; you may just need to be a little more creative. A low-carb diet contains no more than 130 grams of carbohydrates per day, reported a 2008 paper in the journal Nutrition and Metabolism. Leafy, watery vegetables, eggs, and some dairy and soy foods have a place in a low-carb, vegetarian meal plan. Fiber is a form of carbohydrates and counts towards a food's total carbohydrate content. Your body doesn't completely digest or absorb all the fiber carbohydrates found in a food, though. Fiber isn't converted by the body into glucose, which creates the rise in blood sugar that low-carb dieters try to avoid. The American Diabetes Association recommends that when a serving of food has 5 or more grams of fiber, you subtract the fiber grams from the total number of carbohydrate grams to get a truer reading of the food's carbohydrate content. For example, a cup of chickpeas contains 35 grams of carbohydrates, but almost 10 grams of fiber. If you subtract the fiber grams from the carbs, you end up with net carbs of 25 grams per cup of chickpeas. This point is especially relevant for vegetarians who use plant foods -- which are the only sources of fiber -- as the bulk of their diet. You may eat more carbohydrate grams than a meat-eater on a low-carb regimen, but it's likely a lot of those grams are from fiber. Many vegetables contain little in the way of carbohydrate grams and form the foundation of a low-carb, vegetarian diet. 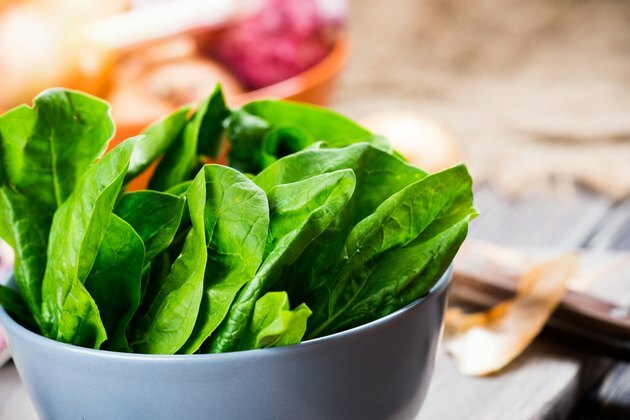 Even the extremely restrictive low-carb phase one of the Atkins diet plan, which restricts you to just 12 to 15 total carbs per day in its first phase, lists leafy greens, such as spinach, arugula and bok choy as acceptable. Other vegetables also make the list of very low-carb foods, including eggplant, asparagus, yellow squash, broccoli, celery, spaghetti squash, green beans, hearts of palm, mushrooms, bell peppers, snow peas and artichokes. The total amount of carbohydrates in each of these vegetables depends on the serving and the makeup of the vegetable itself but, for example, you'll find 11 grams of carbs per cup of boiled broccoli and 1.5 grams per cup of shredded romaine lettuce. When low-carb eating, you'll limit your intake of higher-carb vegetables such as peas, corn, sweet potatoes and white potatoes. A medium baked white potato with the skin contains 37 grams of carbohydrates, a medium baked sweet potato contains 24 grams of carbs and a cup of corn kernels contains 31 grams of carbs. The lowest-carb sources of protein on a vegetarian diet include eggs and soy-based proteins such as tofu and tempeh. One large egg contains about 6 grams of protein and less than half a gram of carbohydrates. A 1-cup serving of soft tofu cubes contains about 16 grams of protein with just 5 grams of carbohydrates and 3.5 ounces of tempeh has 18 grams of protein with about 9 grams of carbs. Low-fat plain Greek yogurt has 6 grams of carbs with 17 ounces of protein in one container. This makes it a lower-carb option compared to 2 percent milk with 12 grams of carbohydrates and 8 grams of protein per cup. Cheese, eaten in moderation to keep your saturated fat content in check, is another lower-carb source of dairy protein. One ounce of cheddar cheese, for example, has almost no carbohydrates with 7 grams of protein. Whey protein powder added to a smoothie or water contains only about 2 grams of carbohydrates per 1/3-cup scoop with 25 grams of protein. Many protein sources in a vegetarian diet contain a fair amount of carbs, including quinoa, dried beans and peas and dairy products. Other than dairy, these foods also tend to be high in fiber, though. For example, 1 cup of lentils contains almost 18 grams of protein, but has 40 grams of carbohydrate with almost 16 grams of fiber. Lima beans, pinto beans and black beans also tend to have less carbohydrates that some other legumes, including chickpeas and white beans, but all contain about 14 grams of protein per cup. If you include these sources of protein in your diet, you may want to stick to servings of about 1/4 cup. Pure oils are your best option for fats when you're on a low-carb diet. Coconut oil, olive oil and avocado oil are healthy fats that are carb-free and can be used for cooking or making salad dressings. Nuts and seeds are also a source of vegetarian protein and healthy unsaturated fat, but are high in calories and, if you eat more than an ounce, provide a fair number of carbohydrate. Almonds, for example, contain about 150 calories per ounce with 6 grams of protein and carbohydrates. Consume a cup to get 30 grams of protein and end up with 828 calories and 31 grams of carbohydrates, a definite diet buster. Diabetes Health: Do I Subtract Fiber From Carbohydrates?